How true, and you don’t get a movie made on you before turning 30, unless you have just done that. Enable 500 million users on your website. how did facebook all start? On a fall night in 2003, Harvard undergrad and computer programming genius Mark Zuckerberg sits down at his computer and heatedly begins working on a new idea. In a fury of blogging and programming, what begins in his dorm room soon becomes a global social network and a revolution in communication. A mere six years and 500 million friends later, Mark Zuckerberg is the youngest billionaire in history… but for this entrepreneur, success leads to both personal and legal complications. 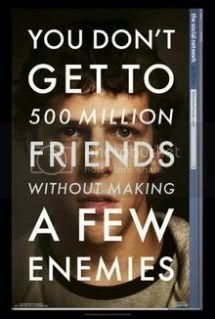 With facebook becoming such a phenomena in the world, it is but natural that there should be a movie made on it, and loads of books written on it, to encash on it even further. Now this would be one must watch. waiting for it to release in the movies, this october 1st.